Reggie Jackson is a retired Major League Baseball outfielder who played for the Kansas City Athletics / Oakland Athletics from 1967 to 1975 and again in 1987, the Baltimore Orioles in 1976, the New York Yankees from 1977 to 1981 and the California Angels from 1982 to 1986. He is a five-time World Series champion for 1972 to 1974, 1977 and 1978 plus is a two-time World Series MVP for 1973 and 1977 as well as the American League MVP for 1973. Jackson is also a fourteen-time All-Star for 1969, 1971 through 1975 and 1977 through 1984. 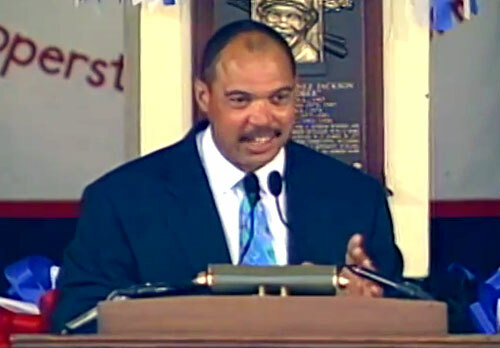 Reggie Jackson was inducted into the Baseball Hall of Fame in 1993. PFP Sports Talent Agency is a top booking agent for motivational sports speakers and sports personalities. If you would like to book MLB stars like Reggie Jackson for a speaking engagement, personal appearance or special event, you can request Reggie Jackson agent and speaker information from PFP Sports Talent Agency or call 800.966.1380.